The Flavel Windsor Contemporary Gas Fire is one of the bestselling fires in our range. With an efficiency rating of 81.3%, it stands up well in terms of energy usage while giving out 2.9kW of heat output, making this Flavel Windsor HE gas fire a smart option. In terms of style, the Flavel Windsor Gas Fire has a sleek and simplistic appearance, available in silver or brass with a coal or pebble effect fuel bed, that will fit seamlessly into many styles of surround. Buy your Flavel Windsor Gas Fire today from Direct Fireplaces at a great price with free delivery! Alternatively, find more Flavel Windsor HE Gas Fires when you browse our full range of high efficiency gas fires. The Flavel WIndsor contemporary gas fire is a manually operated gas fire the controls are located at the front of the fire behind the ashpan cover. The gas fire comes with all the necessary parts to fit it to the gas pipe that should be in place in your fireplace. The fitter should have all the necessary parts and equipment to fit the gas fire to you gas pipe. Hi, is the Flavel Windsor in a wall mountable version? The Flavel Windsor gas fire is available in a number of options. 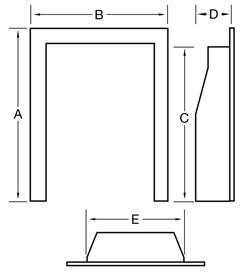 It is primarily an inset fire and there is the option of a hole in the wall fire, which can be placed in a cavity however there isn't a version of it that can be fixed to a flat wall.